1. Own a cast iron skillet. Or several. And learn how to properly use and care for them. 2a. Life is too short for mediocre coffee and bad wine. Buy the best you can afford. 2b. Even if it is just for you. 2c. Especially if it is just for you. 3. A hybrid car is sooooo worth it. 4. If you can make spaghetti sauce, baked chicken, and muffins from scratch you can save big bucks. 5. Real friends stay with you until the tow truck arrives. 6. 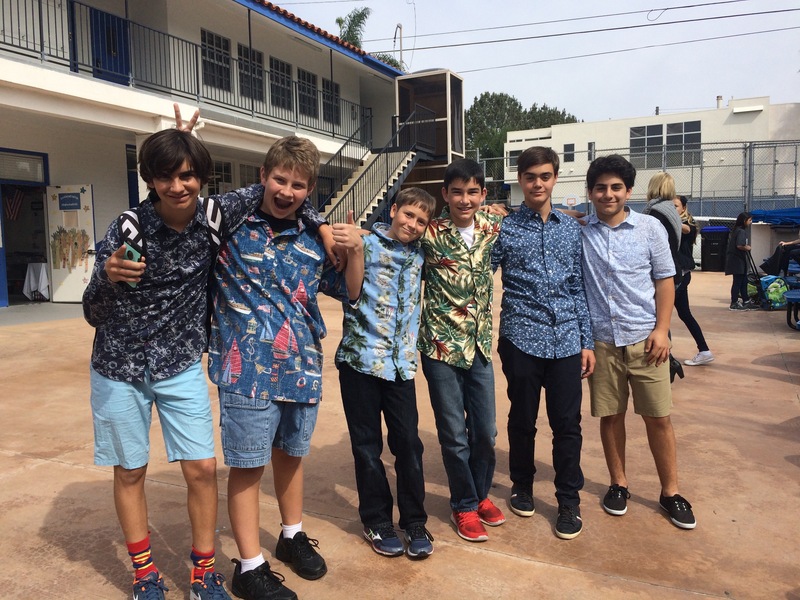 Everyone should own at least one Hawaiian shirt. You never know when a party might break out. 7. Electric kettles are the best! 8. So is iced tea made from plain, black tea. 9. Screen time is overrated. People are underrated. 13. You need a community- humans are social creatures. Join and meet regularly with at least one spiritually/socially edifying group be it a church, synagog, club, society, etc. 14. Stop being so offended by everything, people. It offends me. 15. Spend time with people who lift you up and make you want to be a better person- spiritually, mentally, emotionally. And in turn, be that kind of person for others. 16. Pop your own popcorn. On the stovetop. In a heavy pot. It’s an entirely different species than the microwaved stuff. 18. A trick I learned from a dear and darn near holy woman: want to be the favorite big person with all your friends’ little ones? Always carry candy to share. 19. Pay attention to details. They might be important! Or not… it really isn’t that important that there are no numbers 11 and 12 in this list. 20. Start Small. If you want to try something new every day but don’t know where to start, pick one small project- a new book, decorate an area you have neglected, try a new cuisine. Nothing big- Re-landscape front yard! Read the complete works of Shakespeare!. You’ll be surprised how great it feels to simply repaint your front door. 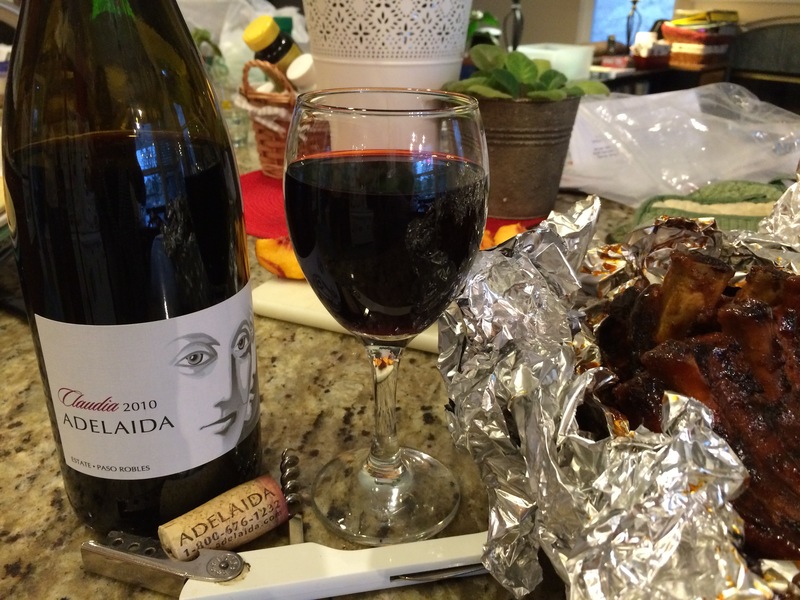 Described as a red Rhone blend, this wine from Adelaida went nicely with our BBQ’d ribs! Ribs and a red. Yum! A little less of a mouthful than the average Chianti in the same price range, this is a nice table red. Light fruit, not very sweet, and a nice bit of tannins, I like it. This was another one of the bottles that we won earlier this year at a raffle held at The Boy’s school. Twenty-four bottles of wine for the price of a $25 ticket… can’t beat that with a stick! Have a wonderful summer evening, everyone. I’m going to enjoy the last of my glass while I listen to The Boy’s excited chatterings. He was just gifted a one day pass to the San Diego Comic Con International and will be going with his sister and me this week since I won those two passes from Fox 5 San Diego. The Girl has some truly generous friends! My good friend Joy has been in the same boat with me for the end of this school year. She’s another mom with 8th and 12th grade graduations, and I just scored- she shared party leftovers with me. Joy’s spanakopita now shares the same ranking as my mom-in-law’s enchiladas- dishes that I will never order at a restaurant ever again because someone’s home made version can never be topped. Ever. I humbly place my cinnamon rolls on that pedestal, too. 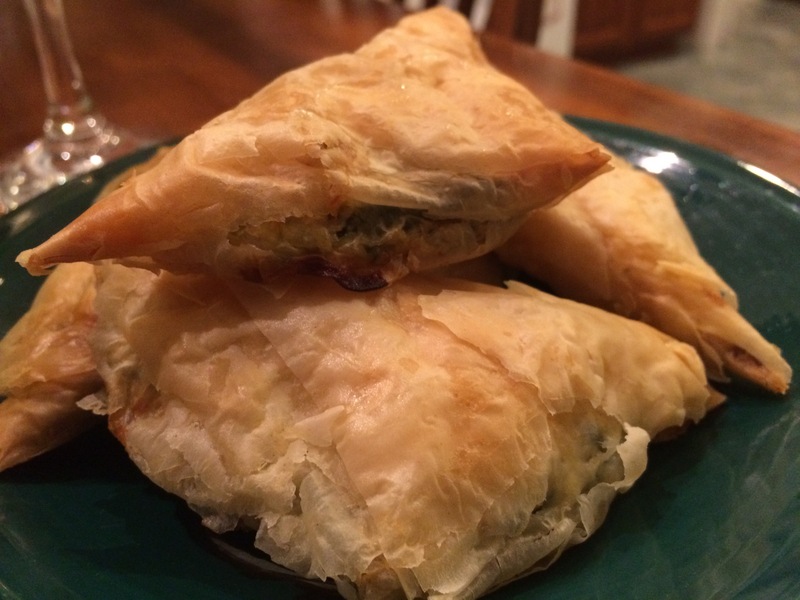 Joy’s pastries were the lightest, most buttery, cheese and spinach-filled Greek pillows of happiness. Unbelievable. This stuff was that good. Thanks, Joy, what fabulous snacks! 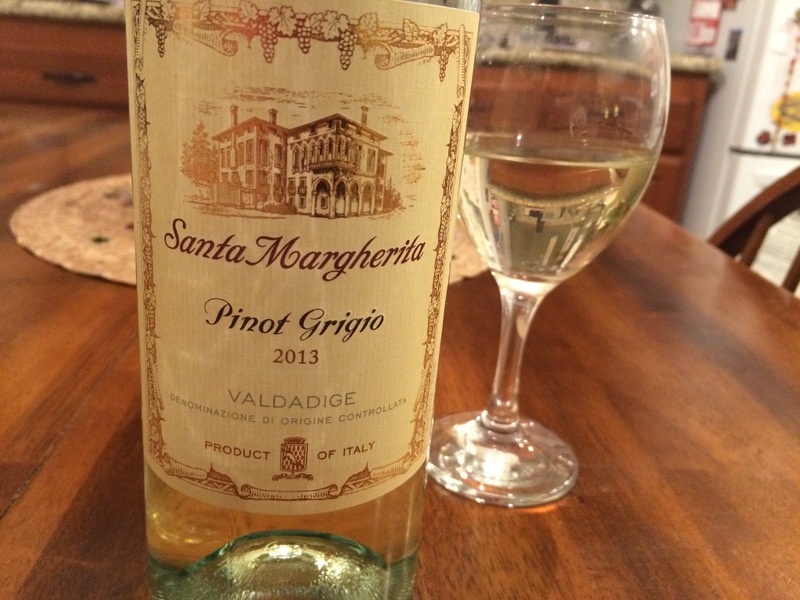 And thanks, too, for the bottle of the Pinot Grigio, the Santa Margherita 2013 from Italy. I’m not too familiar with Pinot Grigio, but I like how it is light, a little sweet and fruity, but still a little on the dry side. I prefer less sweet wines, and this was lovely with the different melons and the spanakopita. A very nice, light wine to sit and share with friends this summer- what wine isn’t better when shared with friends? Joy says it is in Costco now at a great price. Get your summer wines stocked up, everyone! Wine to Wrap-Up a Hectic Week. Or Two. It has been a long couple of weeks. A fortnight fraught with all emotions a person can muster, and more graduate parties and activities than you could shake a stick at. 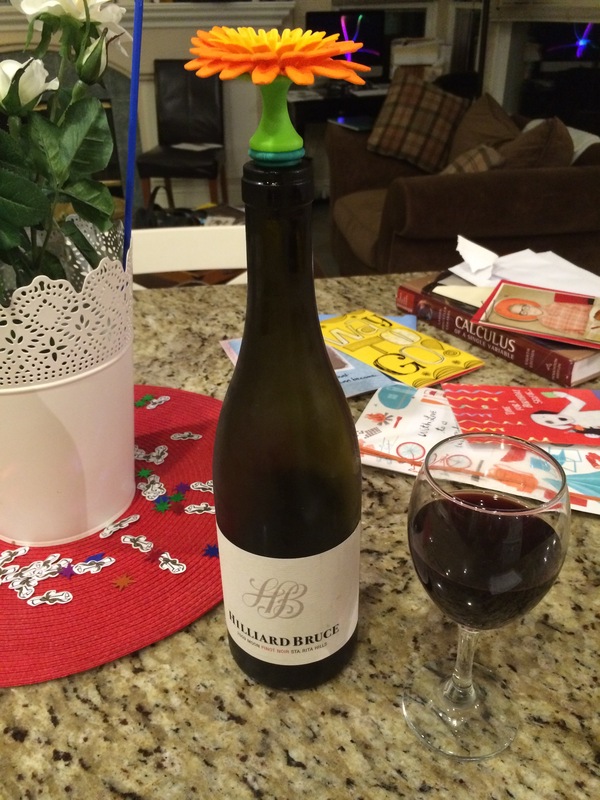 Here is one of our Wine Winnings from a few months ago: Hilliard Bruce 2009 Pinot Noir… very nice. I am just beginning to learn about this red wine, and I like how even though they are not as full of tannins or as powerful as a Cabernet, the Pinot Noir still tastes and feels like a red wine. They are lighter, but not watered down. If you are interested in learning more about this varietal, like me, you might want to start here: Pinot Nor- http://en.wikipedia.org/wiki/Pinot_noir for a simple introduction. Happy drinking, all, and congratulations to all the graduates of 2015! Posted on June 7, 2015 June 7, 2015 Categories Food and DrinkTags Hilliard Bruce 2009 Pinot Noir, Pinot Noir, wineLeave a comment on Wine to Wrap-Up a Hectic Week. Or Two.